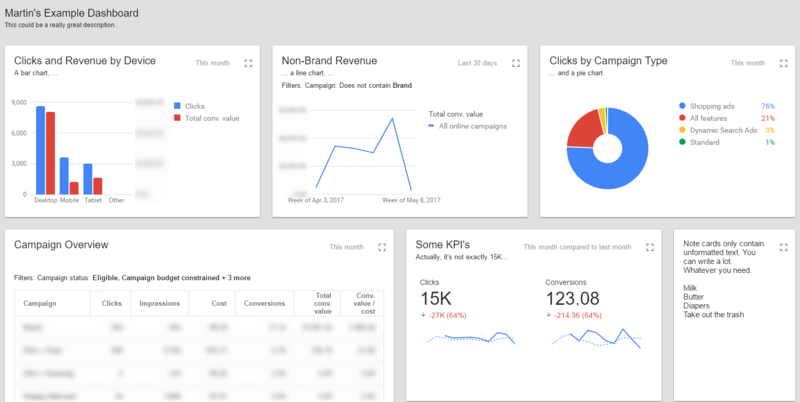 I stumbled upon a new AdWords feature yesterday: In a few of our accounts you can now build dashboards. Charts and tables are fully based on the report editor. You can choose to either use an existing report or create a new one, using all the features the report editor offers. Note cards are nothing more than the name implies. They offer a chance to include some simple text, but due to the lack of any formatting note cards are not as visually appealing as other elements. Score cards can contain one or more KPIs. Only standard AdWords metrics are available (no custom metrics), but the list is quite long. Some numbers are rounded automatically and then displayed according to language. For example, 14,812 clicks became 15K in an English dashboard, while the German version displayed 15,000. As you can see, the dashboard looks quite nice. There are still a few flaws, but since it’s a beta and the feedback button is never far, Google will hopefully straighten those out. The PDF download gives you a copy of the dashboard. However, it’s not as pretty and some numbers can get cut off. Just like reports, dashboards can be scheduled to be sent on a regular basis. You can change the dashboard’s date, allowing you to access the data for past dates. These features make me think that the term “dashboard” doesn’t fully describe what this tool is or can be. Actually, dashboards are a collection of single reports. Usually, collections such as these make up the “reports” we send to clients. Dashboards might be a really nice feature. If you invest a little time in setting them up, you get a useful overview according to your own preferences. Creating and using dashboards is easy and everything seems to work really fast. However, dashboards can do more than to provide a quick overview. Instead, they can be seen as a somewhat powerful reporting tool. Smaller agencies might some day use this tool to do all of their AdWords reporting, as might some inhouse people. Until that time, Google still has a few flaws to iron out. After that, this tool could be really helpful to some people.